This idea just came from the portmanteau that popped into my head. 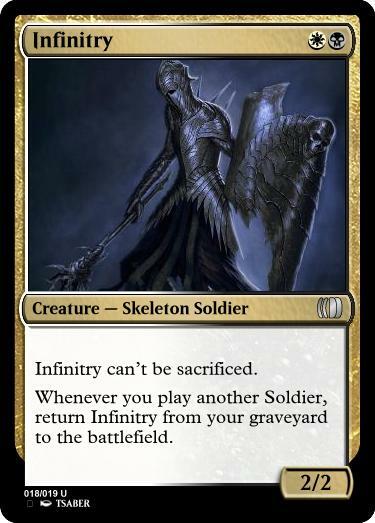 I added the first line after the fact to prevent loops in a unique way, but "can't be sacrificed" feels like a flavor nonbo with infantry. Which makes me feel like this text box should be used on a larger, more unique entity. How is there a loop? The trigger is on-cast and the return is not, so it won't go infinite with itself. Not by itself, but with engines that sacrifice creatures. You would have to be casting infinite soldiers to make this come back an infinite number of times. If it said "Whenever another Soldier ETBs" then it would go infinite a sacrifice effect and two of these once you trigger their ability.